Odds are against it happening peaceably, but Chick-fil-A is doubling down on the plan it laid out in 2014 to put a chicken sandwich in the hands of every New Yorker. The city's first location only arrived in midtown half a year ago, but Chick-fil-A has stayed busy since, erecting a second outpost a mere eight blocks away and plotting an outer-borough invasion, which is expected to begin in Queens. In fact, all told over the next year, it plans to open one dozen additional NYC locations, which will get it close to the number of Panera Breads in the city. What explains this wild success is that, as controversial as Chick-fil-A's politics may be, the corporate office runs a very tight ship and has done nothing but exceed market expectations. 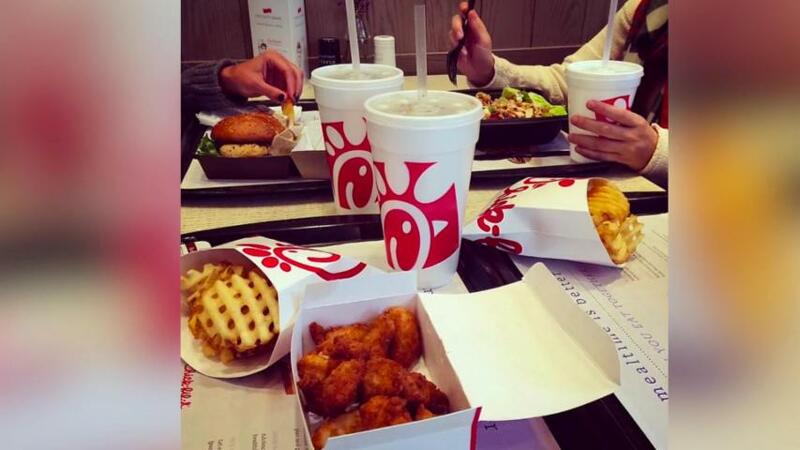 Seemingly out of nowhere in 2014 it overtook KFC as America's biggest chicken chain. McDonald's Japan serves rice cheese balls! A crispy outside with a warm, gooey inside -- YUM. McDonald's India features the McAloo wrap. Aloo is a type of potato curry and McDonald's put its own spin on it by wrapping a flour tortilla around an aloo patty garnished with lettuce, onions, vegetables, and sauce. Pizza Hut Russia serves an Oktoberfest seasonal pizza with Bavarian sausage, pepperoni, vegetables, sauce, and mustard. You like? At Burger King Argentina you can order a Churrasquito. It's grilled over hot coals and served with cheese, lettuce, tomato, and mayo. At select Wendy's locations in Australia, you can order a Brekky dog -- a breakfast style hot dog. GOOD MORNING to that! Taco Bell Japan serves a shrimp and avocado burrito. This exclusive item has only been on the menu since April 2015! Known as 'Maccas' in New Zealand, McDonald's menu there includes 3 savory pies. This one is the Mince 'N' Cheese pie stuffed with ground beef and cheese. At Pizza Hut in Saudi Arabia you can order a seafood pizza, including shrimp, calamari, crab, and vegetables on a thin crust. McDonald's serves porridge in Thailand! You can order chili cheese nuggets from Burger King in Hungary. Bits of jalapeño peppers and a spicy kick. Furthermore, Chick-fil-A's tearing it up at a time when competitors are foundering: It averaged $3.2 million in per-store sales last year, which was 25 percent higher than McDonald's, more than double what Wendy's or Burger King pulled in, and roughly seven times better than Subway, which is having an especially awful year. To ready the non–Bible Belt sector of the country for its arrival, the company did a very public about-face, saying it regretted mixing religion and poultry, and promising to welcome anybody who tries to buy food. But the New York Post points out the chain's still proudly discriminating when it comes to franchisees: Only 0.7 percent of last year's 20,000 applicants got invited to join the team, which the paper notes means "it's easier to get into Harvard than to become a Chick-fil-A franchisee." Just something to keep in mind the next time a franchise owner runs around giddily snapping pics of customers dressed up for the chain's annual Cow Appreciation Day.